Clover root curculio damage is being observed is several parts of Wisconsin this year. It is an occasional insect pest on alfalfa, clovers and other legumes. Damage can be serious but usually is infrequent and localized. Adults are a blunt-snouted weevil, approximately 1/8 inch long and grayish in color. Larvae are small, grow up to ¼ inch long, have a whitish to cream color grublike body and a tan head. Clover root curculios overwinter as adults and complete one generation per year. Peak egg laying occurs in early to mid-June and eggs will hatch within 1-2 weeks. Young larvae will begin chewing on small roots and/or nodules. As larvae mature, they begin feeding on the main taproot. This feeding appears as scars which may be described as “furrows” or “galleries”. When severe, the damage may completely girdle the taproot. Damaged areas of the root system can look similar to damage caused by plant pathogenic fungi in the group Rhizoctonia. 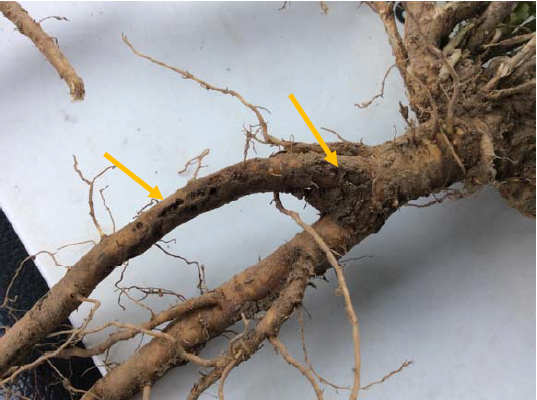 Damage to root systems caused by Rhizoctonia will appear as circular/elliptical lesisons with defined margins on taproots or lateral roots or longer expanding cankers depending on the species. These brown and sunken symptoms differ from the distinctive chewing scars caused by clover root curculio. Larval damage can reduce the longevity of a stand and serve as entry points for pathogens. As many as 30 different plant pathogens have been associated with curculio feeding sites, including Rhizoctonia spp. mentioned above. However, the primary plant pathogenic organisms associated with these sites are Fusarium fungi, including the organisms that cause Fusarium root rot and Fusarium wilt. Larvae have also been implicated in carrying plant pathogenic fungi to non-infected areas of root systems. Adult clover root curculio begin to appear 5-6 weeks after egg hatch. Adults may feed on foliage of young seedlings or mature plants by chewing round notches on the margins of leaves. However, this feeding is usually not an economic concern unless populations are extremely high. Although adults are capable of flying, most migrate by walking from field to field. During hot summer days, adults remain relatively inactive. Larvae cause the greatest amount of damage. There are no insecticide treatments that will control clover root curculio larvae. Neither are there fungicide treatments that will control the diseases associated with this insect. Headline® is registered for control of Rhizoctonia blight but this foliar problem is different than the Rhizoctonia root rot that might be associated with feeding by clover root curculio. Thus, fungicide applications are not labeled or recommended for advanced root rot on alfalfa. Damage from clover root curculio is generally a combination of insect and pathogen injury which result in premature stand decline (2 to 3 years). Clover root curculio has also been known to kill alfalfa seedlings when a field is seeded next to an older stand that harbors a large population of this pest. 1.Minimize spread of the insect when going from infected fields to fields without the problem by cleaning tillage equipment carefully. 2.Plan on a short rotation of alfalfa (3 years including seeding year) after which yields decline even under conditions without the clover root curculio and to maximize the rotational benefit of alfalfa to other crops in the rotation. 3.Do not replant alfalfa into infected fields for two years.